Coffee fans love the convenience of their single-serve machines. You don’t have to bother with soggy paper coffee filters, washing a glass carafe, or measuring coffee. These coffee makers do need a little TLC sometimes, though. Because inside of that single-cup machine, mineral deposits are accumulating on the heating element, which affects both water flow and proper brewing temperature. With time, those mineral deposits can destroy your machine. Use Bar Keepers Friend Coffee Maker Descaler to remove crusty deposits from your single-cup coffee maker every three months (or sooner, if you notice the coffee flow seems slower). It’s an easy way to get the most life out of your coffee maker. 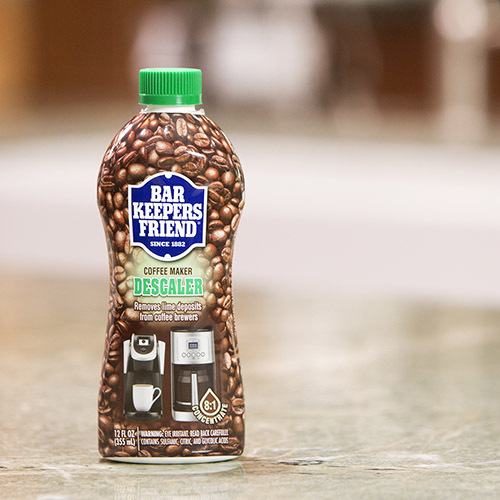 Bar Keepers Friend Coffee Maker Descaler contains specifically selected acidic ingredients that get rid of harmful mineral deposits inside your single-cup coffee maker, but that acidity can potentially harm delicate finishes. If you have marble, granite, or other natural stone countertops, cover them before you start descaling. Remove any coffee pod from your coffee maker, and make sure the reservoir is empty. Fill your carafe with cold water, and put on your protective gloves. Place a ceramic mug under the discharge (ideally, a cup with the same capacity as your machine’s largest cup-brewing volume). Fill the reservoir with cold water, adding one ounce of Bar Keepers Friend Coffee Maker Descaler for every eight ounces of water. Initiate the brew cycle; you will need to repeat this step several times to completely empty the reservoir. After the reservoir is empty, fill it with cold water and initiate the brew cycle to rinse the inside of the machine, repeating the brew cycle until the reservoir is empty again. Add fresh water before brewing your next cup. It doesn’t take long to descale a single-cup coffee maker, and it’s time well spent – regular descaling helps keep your machine in tip-top shape.